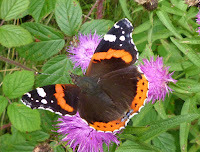 I haven't included butterflies in my website until recently because there is plenty of information on these insects both in books and on the internet. However, I've given in, particularly when I saw David Attenborough encouraging everyone to count them so that we can keep track on how they are fairing. 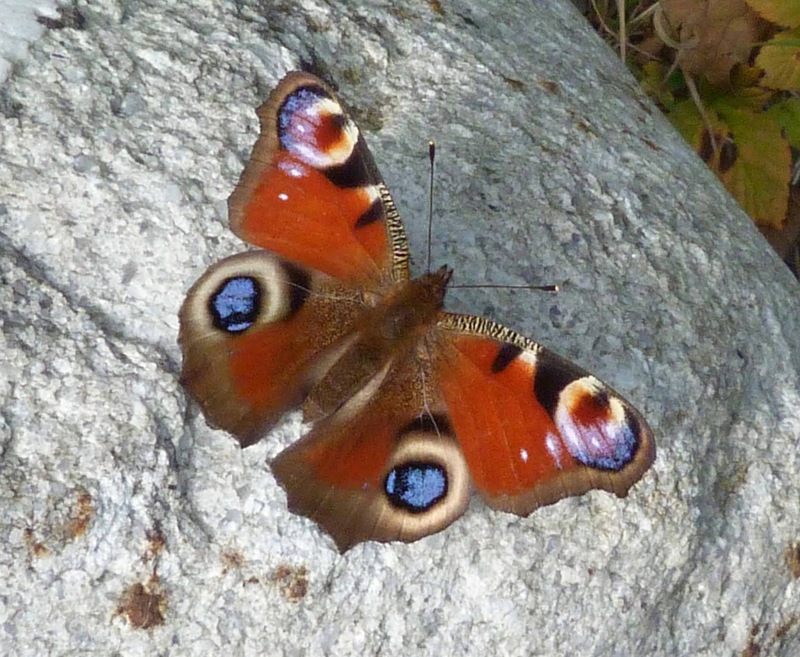 This is a very recognisable and well known butterfly, it has these large eye-spots on its wings presumably to ward off prey. The red, purple and blue make this a very colourful butterfly, although when its wings are closed it is almost all dark brown/black, as can be seen in the photo on the bottom left. The caterpillars are a velvety black with white dots and long black 'spikes' along their 'backs'. The best thing about butterflies in general is that they are the only insect I can photograph without getting strange looks. This was found on a slightly chilly and breezy day at the end of August. It was enormous - somewhere in the region of 7 - 8 cms. 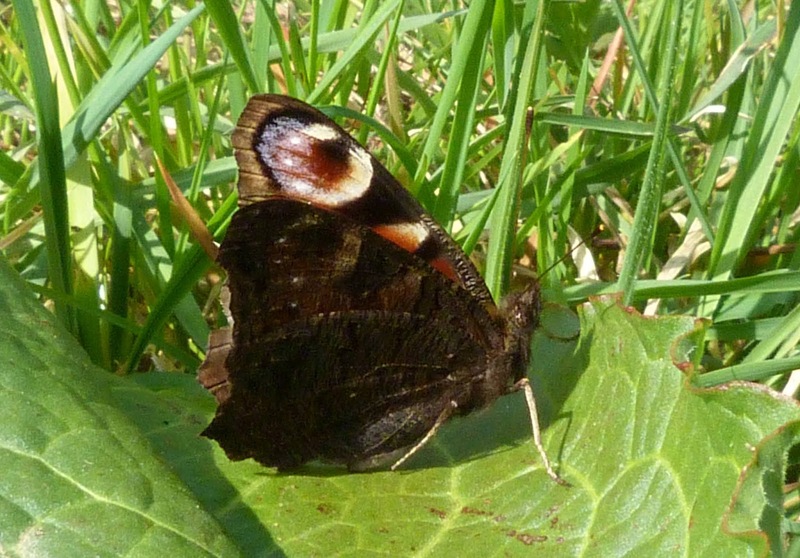 These are very familiar butterflies with their striking dark brown and red bands and black and white wing tips. 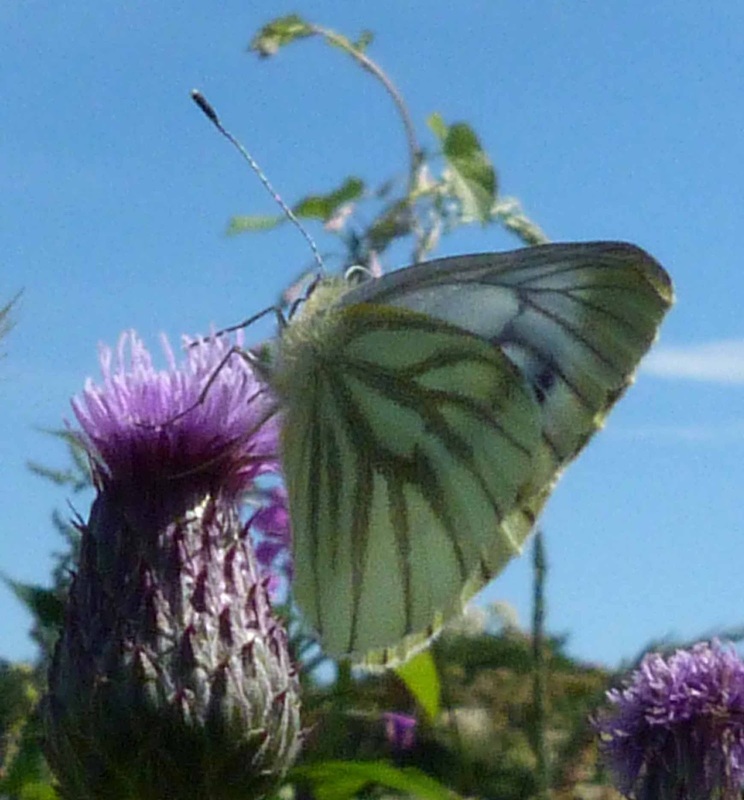 They are common in parks and gardens throughout the UK and can be found almost anywhere, including at the top of mountains and in Orkney and Shetland. Firstly, apologies for the quality of these photos. I was never able to get close enough to this butterfly to get a decent shot of it, other than at a bad angle. 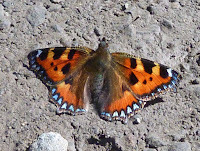 Anyway, when I spotted this, I wasn't very sure what it was - it seemed to be a bit of a cross between the small tortoiseshell above and the fritillary below. 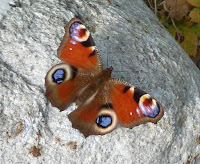 It was also circling repeatedly with a peacock butterfly at the time. 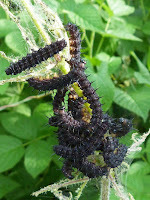 I don't know if they were fighting for territory or attracted to one another. 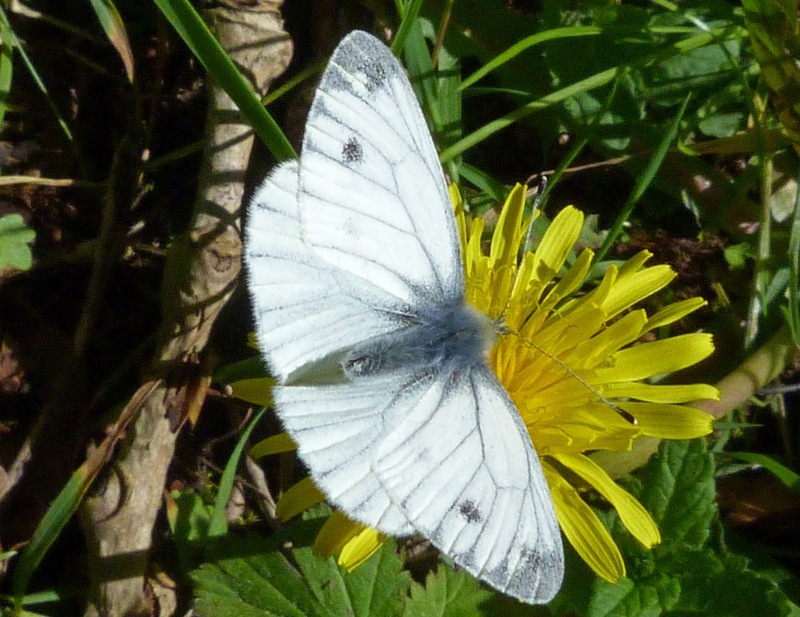 Anyway, an interesting fact about this butterfly is that the insect books I have right up until 2005 say that this is absent from Scotland! Clearly, it isn't and from more recent texts and internet searches I can see it has begun to make an appearance in Scotland too, although it's far from common. It's hard to see from these photos, but the edges are very 'ragged' looking which distinguishes it from the other similar butterflies. 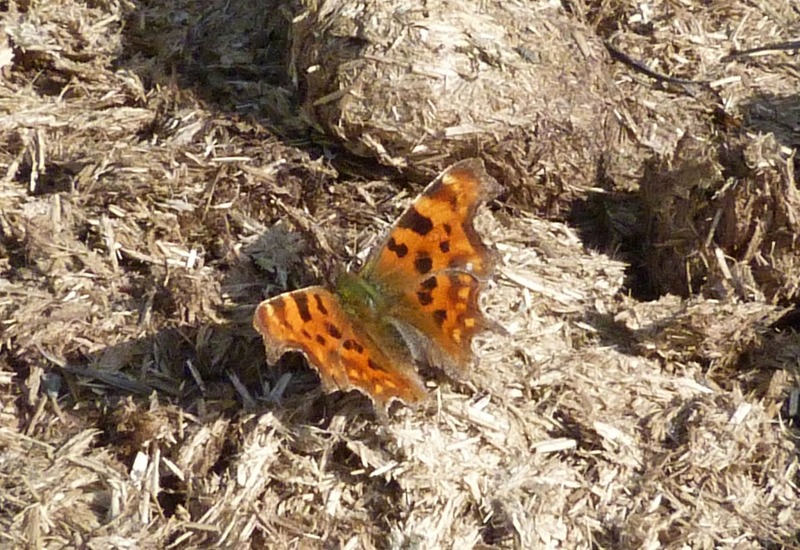 It's called a 'comma' butterfly because on the dark underside, there is a white comma like mark on each wing, but it wasn't glaringly obvious to me. 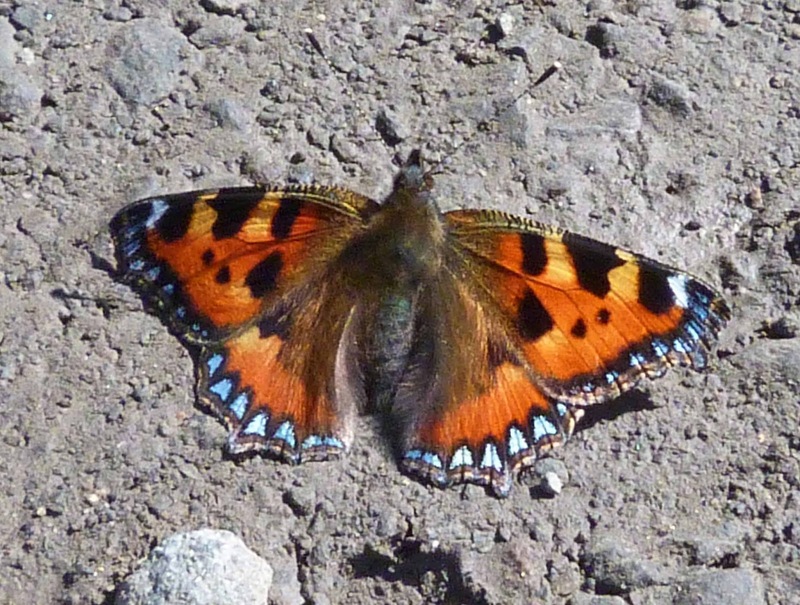 One last point to note is that there are several different forms of this butterfly, so they may vary from the one shown here. A stunningly beautiful butterfly but a difficult one to photograph as they only rests very briefly before flying off again. Apparently, they will rest for longer with their wings open early in the morning. 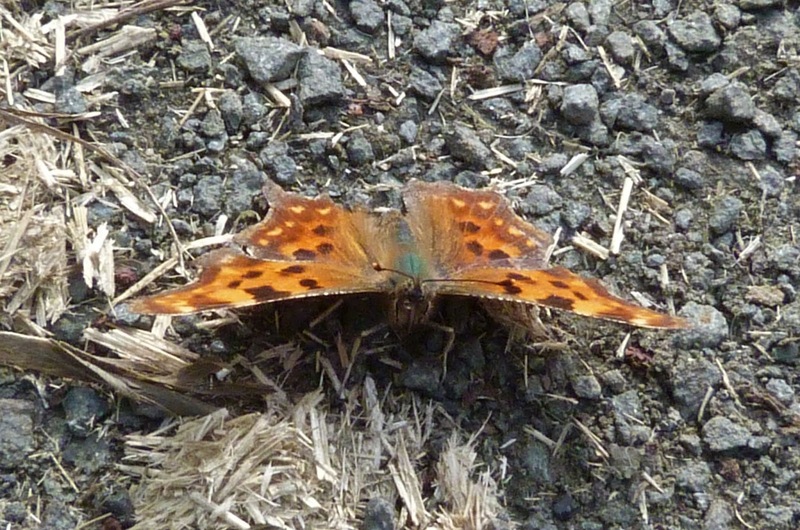 The upper side of this butterfly, like most fritillaries, is orange with black markings, although you can only see the underside here. With the white lacing all down the edges of it's underwings outlined in black, it is easy to see why it is called pearl-bordered. 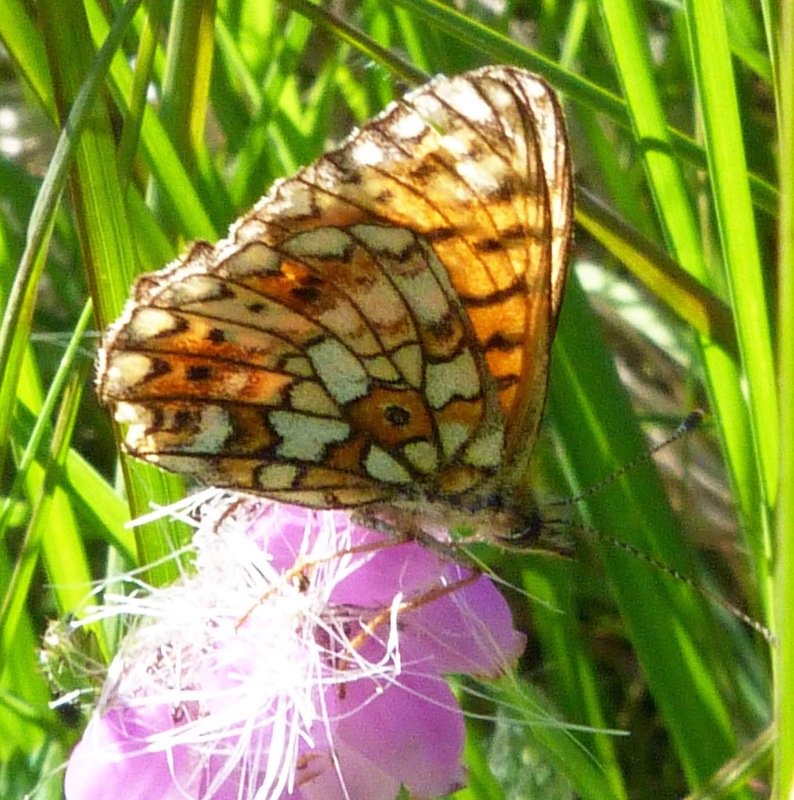 The small pearl-bordered fritillary has a number of white 'squares' in the middle of its wing and an arching row of black dots beneath its 'pearls'. 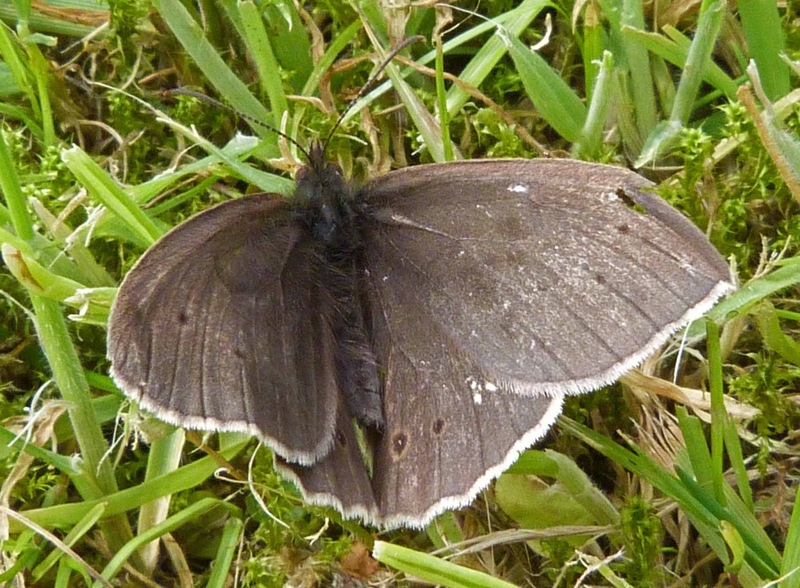 It also has a large black dot in the centre of its wing. 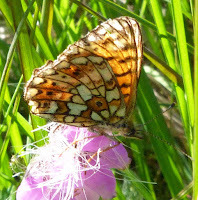 Pear-bordered fritillaries on the other hand only has 2 white squares and no central black dot. These butterflies are widespread throughout Scotland but only western in England. The male, as in the top photos, has these unmistakable orange wing tips, whereas the female (at the bottom) is all white and can be confused with other white butterflies. 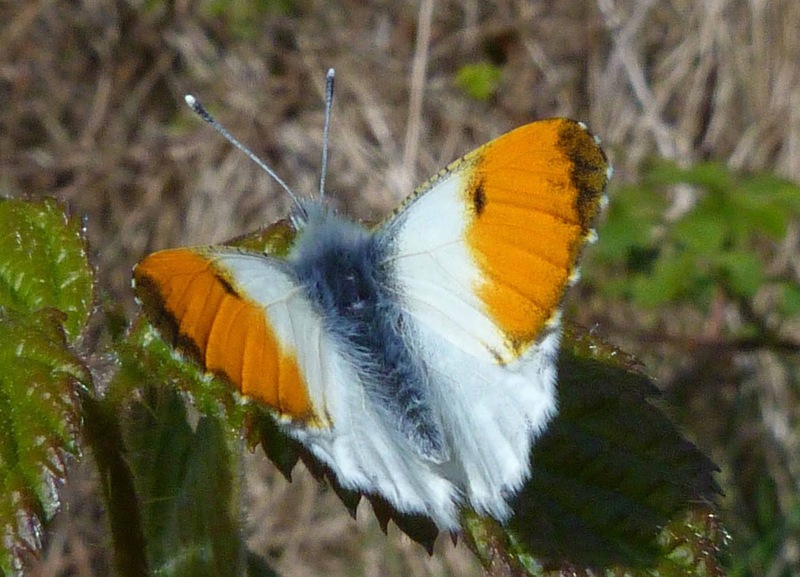 The poor female must wonder if it's colour-blind when people point at it saying, 'Look, there is an orange-tip!' 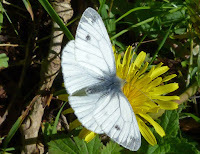 With its wings closed both the male and the female have this distinctive white and mustard mottled colouring. Although these are common throughout the UK, they are apparently rarer in the north of Scotland. It was difficult getting a picture of these butterflies with their wings closed as they do not seem to rest for very long, but luckily I came across a pair mating, which gave me more time to get a picture of the underside of their wings. 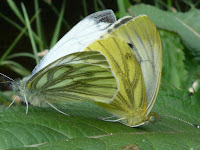 The upper side of the wings are mainly white, with females having two black spots on the upper side of the forewings and males having just one (as in the photo on the left). 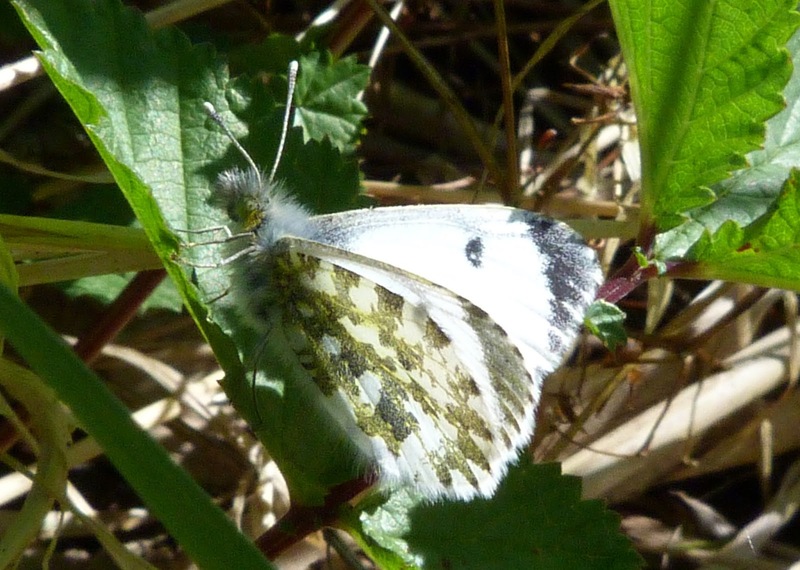 The male can look a bit like female orange tip butterflies, which donn't have orange tips - but when the wings are closed, this green-veined white has, as you can see here these greenish-grey veins on the underside of its wings, making the identification of this butterfly unmistakeable. 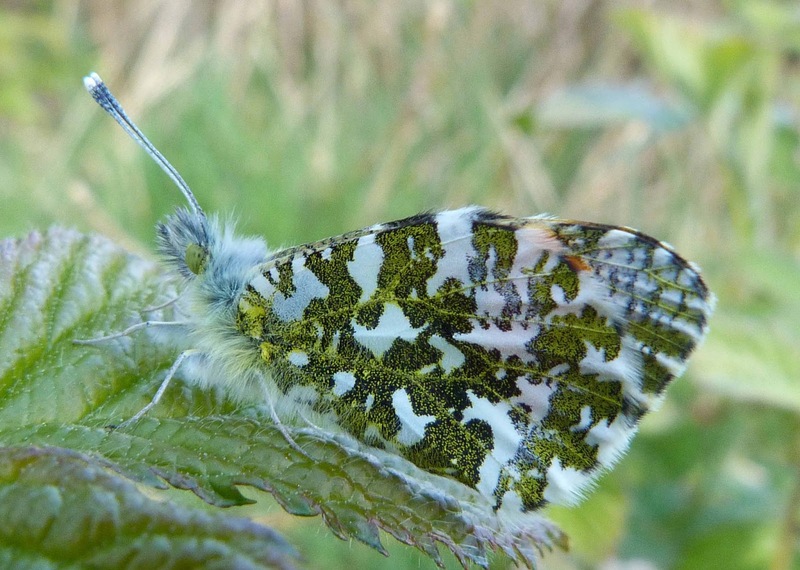 With the wings open, I think the black tips of this species are a bit more grey and less black than the female orange-tips, but that might just be me. 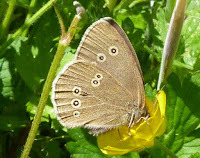 The yellow-ringed eyes on the underside of the wing give this butterfly its name (as you can see from the photos on the right). 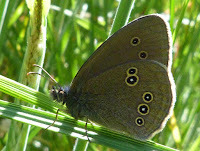 The male has the small dark spots on the upper side of its wings (as on the left) whereas the female has similar rings on the upper side of its wings as there are on the underside (as you can just about see in the photo on the bottom left). 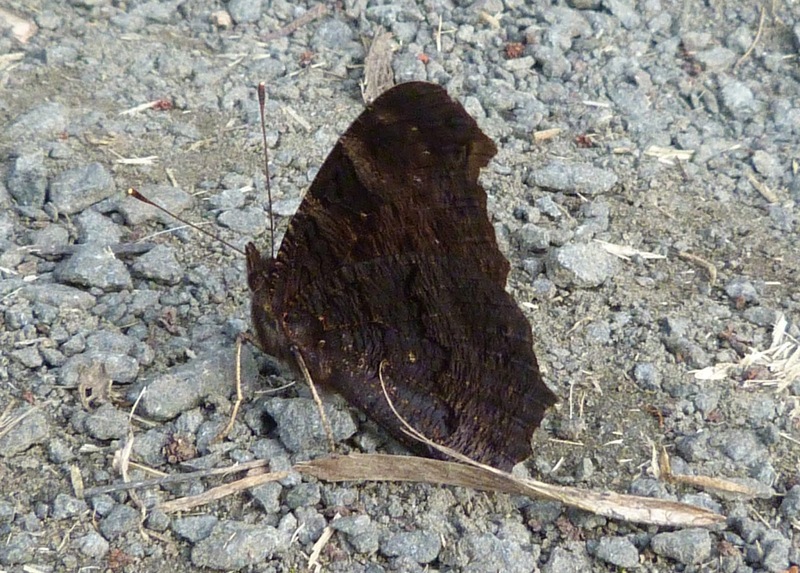 A bit of a dull butterfly which some may confuse with a moth due to its lack of vibrant colouring associated with butterflies. The way to tell butterflies from moths is by looking at their antennae. 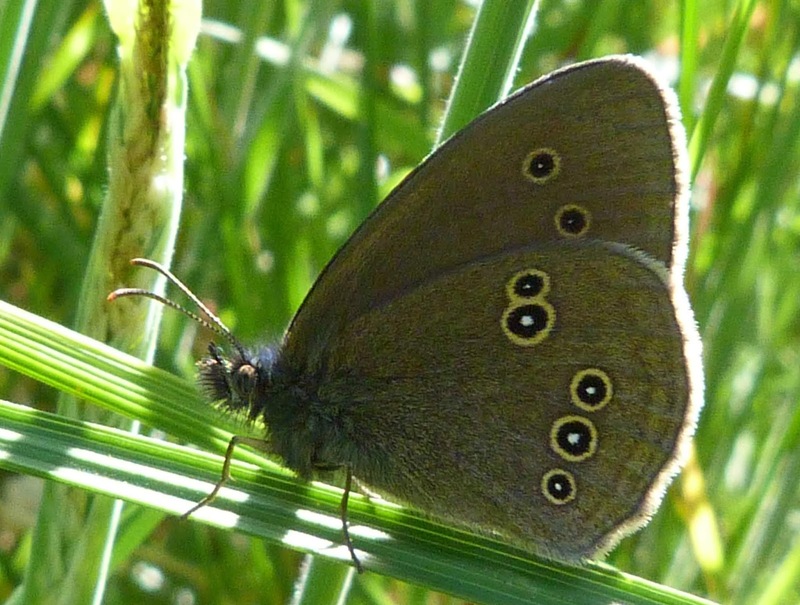 Butterflies have straight antennae with little 'knobs' at the end (much as you see in children's drawings) whereas moths' antennae are feathery or saw-edged. Unless you can get close enough to them, it can sometimes be pretty difficult to tell one way or the other. 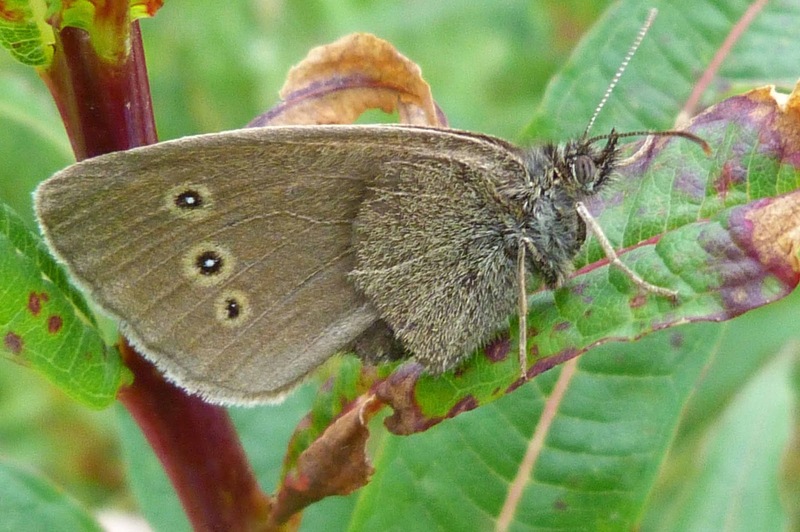 The reason I've included the terrible photo on the right, is that although it is an appalling photograph, it does in fact more closely resemble how a small heath butterfly looks. The photo on the left is a bit misleading - I think it is the way the light is hitting it or something. 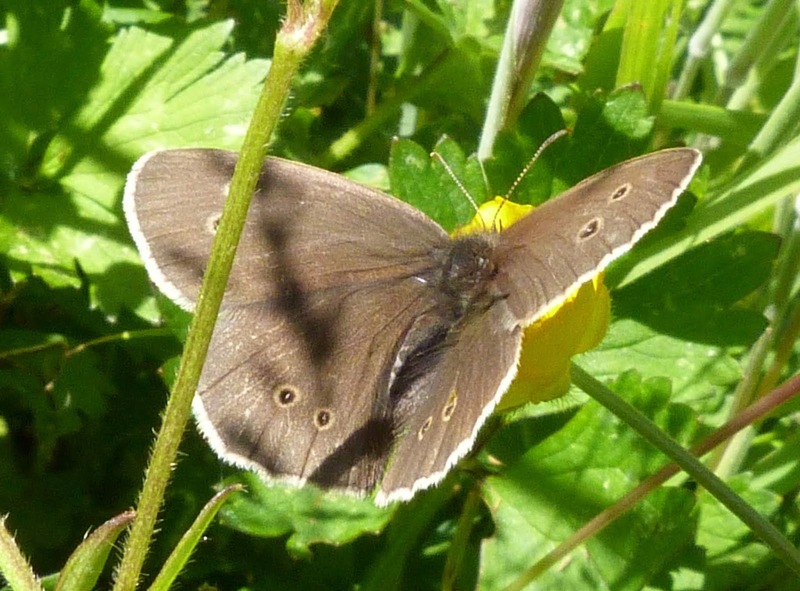 Or perhaps it is a different species - there appears to be a heath butterfly known as Ceononypha scotica but I can't find much about it. 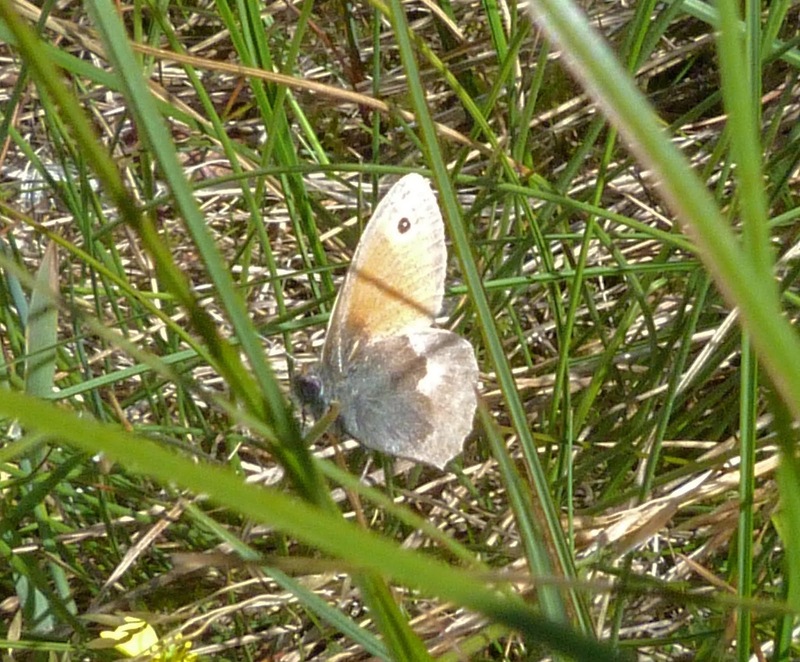 The small heath butterfly is orange and white and brown with one eye spot on the top wing. 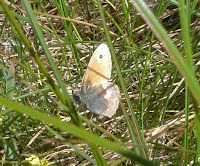 The large heath butterfly on the other hand has several eye spots. An interestingly, whenever it settles, it always does so with its wings closed. 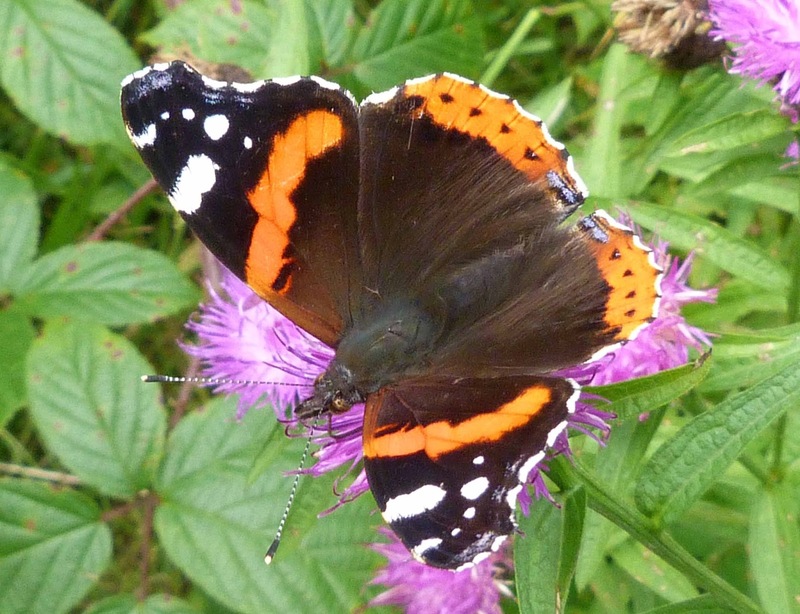 This is one of the most common butterflies in the UK. 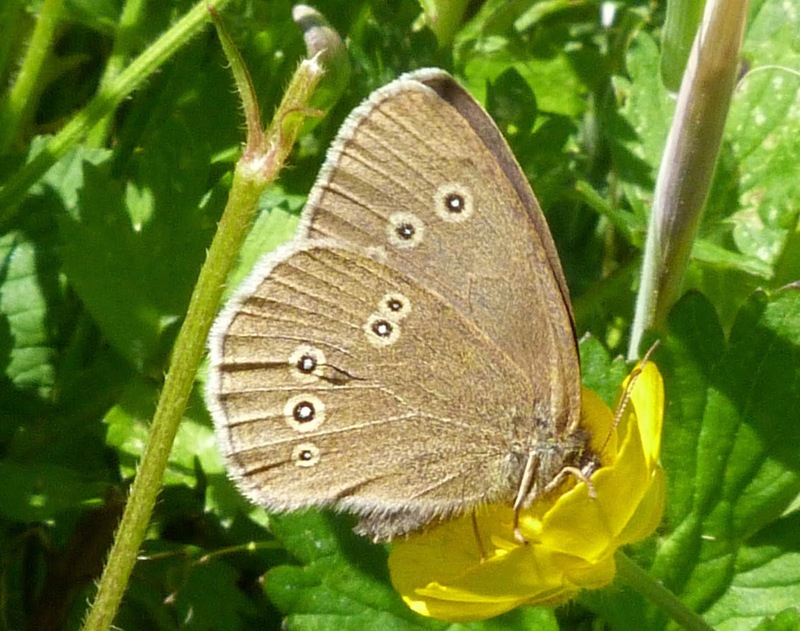 Unlike the Gatekeeper butterfly, it only has a single white spot within the black eyespot whereas the Gatekeeper has two white spots. 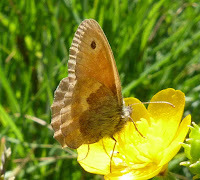 The patch beside the female is a bit brighter and more orange in colour whereas in males it is a duller brown. 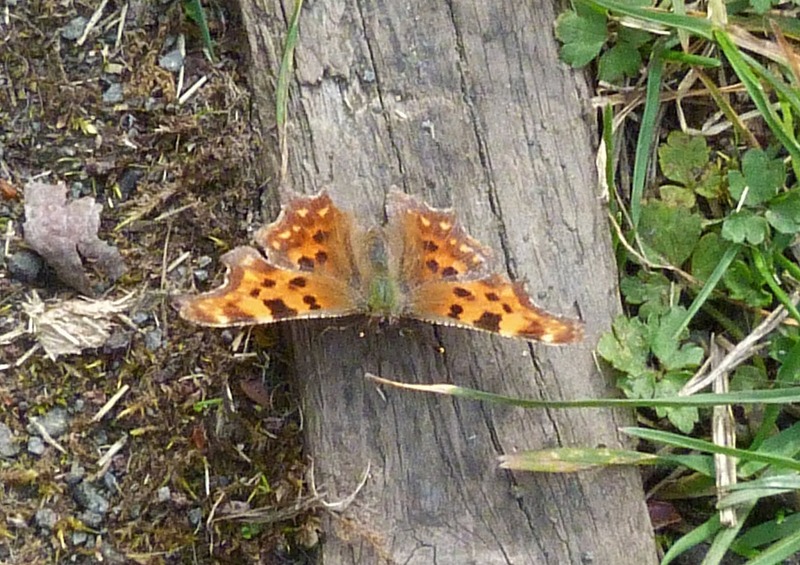 There are sometimes dark spots on the underside of the wing, but this can vary. Given the relative size of butterflies in comparison to most of the insects I photograph, I thought photographing them would be a piece of cake, but in fact they have turned out to be much more difficult than I expected as they never seem to settle for very long and are exceedingly camera shy. 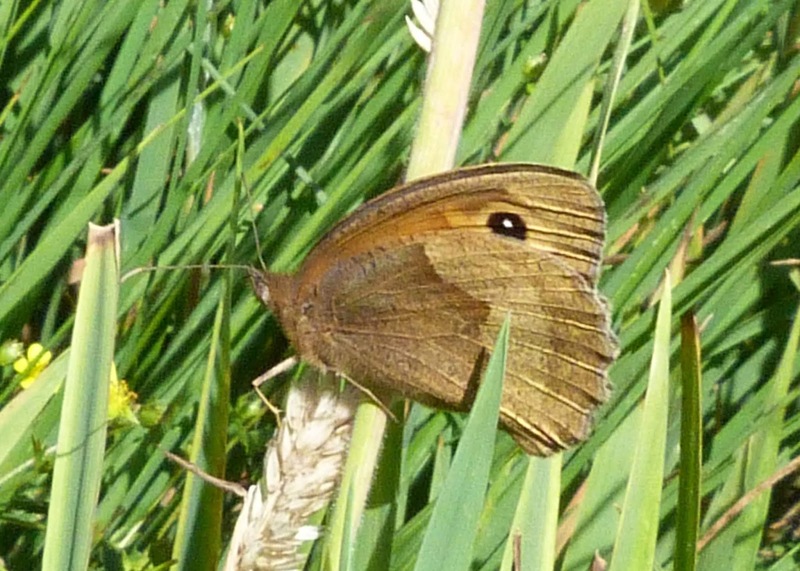 They also have a habit of resting in long grass where it is difficult to focus on them. Still, I'll keep persevering in the hope that I can get better photos as time goes on.